Colonists loved drinking tea more than anything in the American colonies. The British Parliament decided to use this to their advantage, by passing the Tea Act on May 10, 1773, which gave the British East India Company Tea a monopoly. Colonists were really upset because this was ‘‘Taxation without Representation.” This means there was no representative from the American Colonies in the British Parliament. A secret group of the American colonies called The Sons of Liberty disguised themselves as Mohawk Indians boarded three ships that were docked at the Boston Harbor. 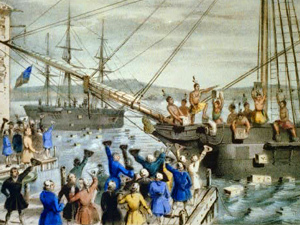 After boarding the ships, they dumped over 92,000 pounds of tea into the harbor on December 16, 1773. This became known as the Boston Tea Party. Some of the Sons of Liberty members even went in boats to hit the tea with oars and clubs in an attempt to sink them to make the tea completely useless. This news reached London, England in January 20, 1774. King George III was really angry at the colonists’ protests. So, Intolerable Acts was passed, but the colonists protested over that, too. It was, however, the first important act of rebellion by the American Colonists, which eventually led to the beginning of the American Revolution.